Global Earthquakes and Tsunamis by East or West Longitude. | Chaos Sweeps Away the World We Know! The Disaster, current events & Catastrophe Blog. Forecasts for 2014 to 2022. Read tomorrows news today! Plus current economic, commodities, stock indices and financial news. 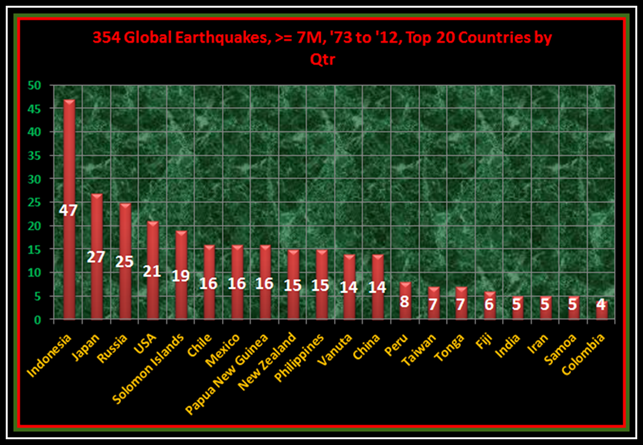 Global Earthquakes and Tsunamis by East or West Longitude. 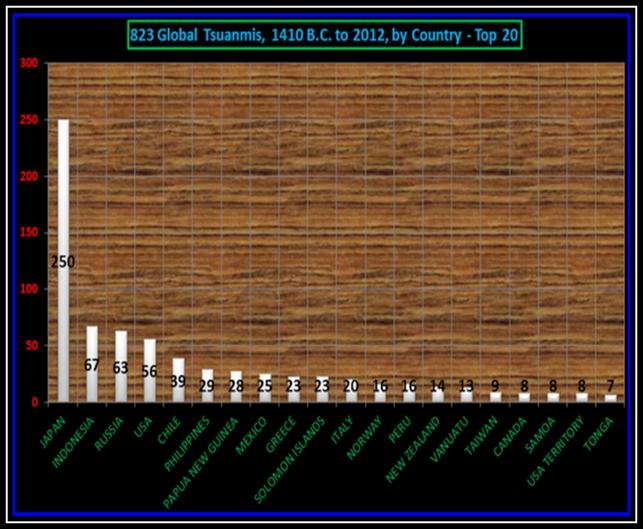 May 6, 2012 – Earthquakes and Tsunamis by Longitude: The graph above reflects global earthquakes and tsunamis by east and west longitude. The data was downloaded from NOAA. Both the earthquake and tsunami databases were through May 5, 2012. The earthquake data started in 2150 B.C. and included 4,162 years, for magnitude 7 or higher, with 1,457 events. The tsunami data started in 1410 B.C. and included 3,422 years, with 813 events. The zero (0*) Longitude line runs vertically through Greenwich, England (just east of London). 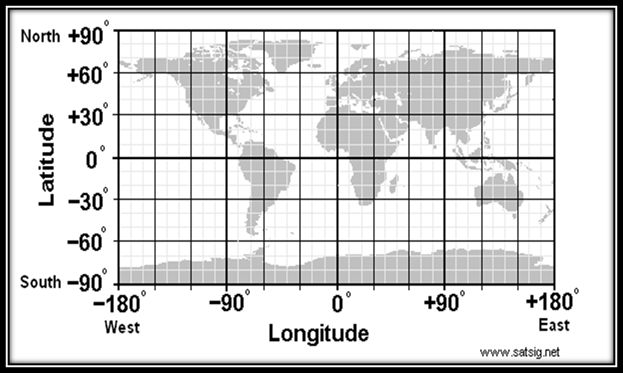 From 0* to -180* is west longitude, while 0* to +180* is east longitude. Zero (0*) latitude marks earth’s equator, with 0* to +90 marking north latitude and 0* to -90* showing south latitude. Both longitude and latitude are measured in degrees, minutes and seconds. There are 60 minutes in one degree and 60 seconds in one minute. The east has the most quakes because the countries with the most earthquakes are located in the east, e.g., Indonesia, Japan, Russia, etc. (see graph). The 21 quakes shown for the USA were mostly in Alaska or the Aleutian Island chain (12), California (7), Idaho (1) and Hawaii (1). So far, 2012 has seen six quakes greater than 7.0 magnitude. Three of those were off the west coast of Northern Sumatra (Indonesia), one in the Vanuatu Islands, one in Mexico and one in Chile. 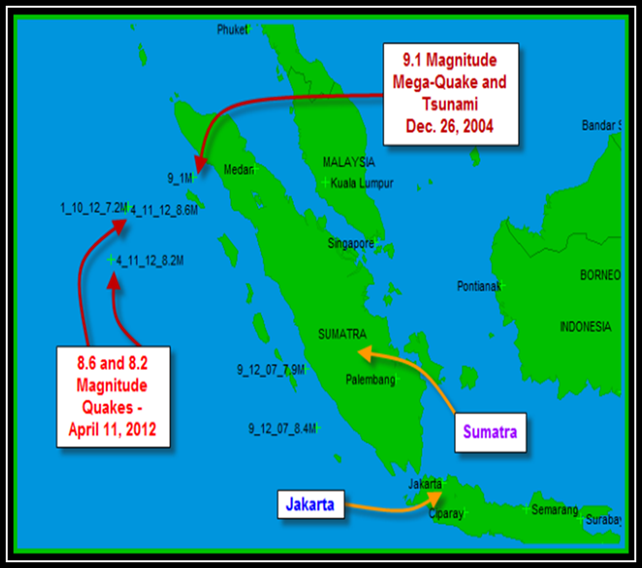 The last two on the list occurred on April 11, 2012 and where 8.6 and 8.2 events that were only two hours and five minutes apart (both off the west coast of Northern Sumatra). Japan had 250 and Indonesia 57, which are both in east longitude. One reason Japan shows so many tsunamis is that they tended to keep better records than other countries, and the country is prone to tsunamis generated primarily from earthquakes. Of the 56 USA tsunamis, the oldest is the January 26, 1700 Cascadia Subduction Zone event; which took place off the northwest coast of the U.S. The newest on the list took place on September 2, 2011; at the Fox Islands, Aleutian Islands, Alaska. It is interesting to note that of these 56 tsunamis, seven were greater than 100 feet high. The highest of any tsunami reported over the 3,422 year period is the July 10, 1958 southeast Alaska event; which was an incredible 1,722 feet high (see my post on this event). Further, of the 56 U.S. tsunamis; seven had tsunamis greater than 100 feet, with the oldest listed first: 394’, 200’, 110’, 490’, 115’, 1,722’ and 220’ (all in Alaska). Lastly, the 1,722 foot July 1958 tsunami was cause by a landslide, rather than an earthquake or volcanic eruption. This entry was posted in Alaska Earthquakes, Aleutian Islands Volcanoes, Earthquake, Indonesia, Japan, Uncategorized, United States and tagged global earthqaukes and tsunamis by east and west longitude, The Master of Disaster. Bookmark the permalink. 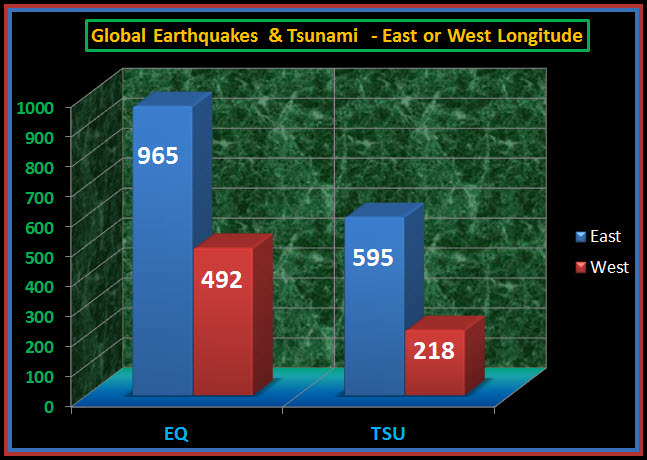 1 Response to Global Earthquakes and Tsunamis by East or West Longitude. Thank you for the intense detail.